Bruxism is a medical term for the problem of tooth grinding. 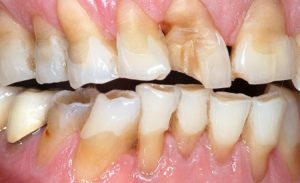 It is generally seen that people have a habit of grinding or clenching teeth either awake or during sleep. If frequent action is not taken, then it may lead to severe cracking of teeth or weak teeth. In some cases it has damaged the jaw points, resulting into a serious headache, disrupted sleep and many more disorders. If you are facing the problem of bruxism, then you must immediately visit to a dentist. If You are in Ahmedbad then Consult with Dr.Mansi Patel For Bruxism Treatment in Ahmedbad. You grind your teeth while sleeping or while focusing on something. Usually people doesn’t care much about having the problem of bruxism until it becomes severe, leading to cracked teeth, jaw pain which is known as TMJ, headache, damaged tooth and gum recession. The problem of bruxism can be treated easily if it is identified earlier. One can easily get over it by muscular exercises, sleep hygiene some behavioural therapies and with the use of mouth guards that safe your teeth by getting grinded. To prevent your teeth of getting grinded or cracked and to treat the bruxism, mouth guards are the easiest option as they are available at markets at affordable prices. Initially, the mouth guards were hard to apply and people had some issues while using it like teeth movement as they were unlikely to fit in the mouth. But nowadays, we have better mouth guards available in the market that can easily fit in any mouth size, either for your upper teeth or lowers ones. The new version of mouth guards is known as mouth splints that have synonyms like occlusal splints or bite plates that can easily fit to your upper or lower teeth. One can use a mouth guard for six months. Whereas, mouth splints lasts for years and that’s why are extensively used. There is another category of mouth guards known as somnobrux which is worn only during sleep to prevent grinding of teeth and to alleviate jaw pain. It creates a barrier between both sets of teeth (upper half set and the lower half set). They have been designed according to the types of bruxism issues and are most comfortable to wear. You can talk, yawn or even drink while wearing them. So if you are having this problem of bruxism, don’t hesitate to have your own mouth guard as it is going to be worth for your teeth so that you don’t need to go for expensive teeth surgeries. Dr.Mansi Patel is senior Dental Surgeon in ahmedbad Gujrat. She treated well bruxism diseases. Consult her now.